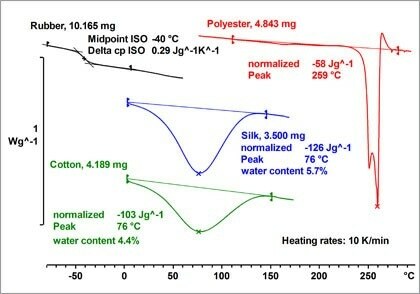 Thermal analysis (TA) can be applied to various textiles to investigate their shrinkage or expansion behavior, moisture content, usable temperature range, thermal stability, the effect of UV, and fiber strength. This webinar provides coverage on the main thermal analysis techniques used for the assessment of fibers, filaments, threads, fabrics or final textile products. DSC – used to investigate glass transition, melting behavior, reaction enthalpies, and the influence of fillers. TGA – the main applications of TGA are composition analysis, thermal stability and evaporation behavior. TMA – is used to study the expansion or shrinkage of materials. DMA – the best method for characterizing the viscoelastic behavior of materials.